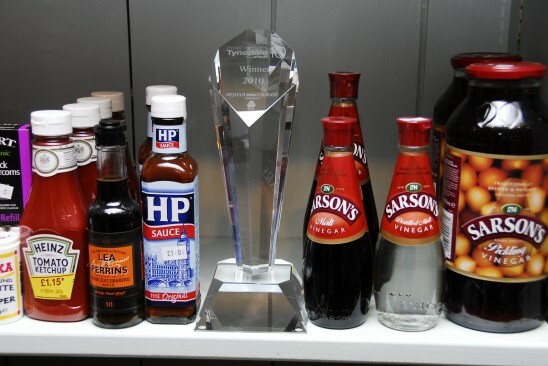 The Shop is really puffed up with pride after winning not one but two Pride in Tynedale Awards. 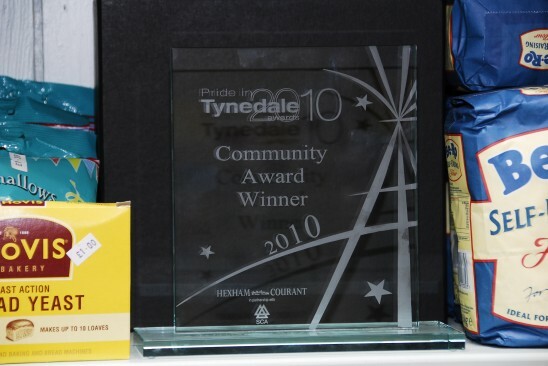 At a special ceremony at Hexham Racecourse on Friday March 25th Humshaugh Community Ventures Limited won the Community Award (pictured below) and the prestigious main Pride in Tynedale Award (above). The 2010 awards, organised by the Hexham Courant, should have taken place in December but the event was postponed because of the severe winter weather. In the community category HCVL beat fellow finalists Prudhoe Gardeners’ Association and the Hearth Arts Centre at Horsley. To win the overall award Humshaugh Community Ventures were up against the winners of the retail category: Wheelbirks Farm near Stocksfield; Hexham Community Partnership, who’d won the Tourism Award, and Young Business Award winner Rachel Lawson, owner of ‘What a Clip’, in Prudhoe. Here’s what the Editor of the Courant, Colin Tapping, said when he announced the winner of the overall award: “Choosing one outstanding candidate from the winners of the four categories is a difficult task. In each of them, Tynedale can indeed be very proud. All of them are fine examples that other like-minded groups and individuals others will do well to follow. “The overall winners have a heart-warming tale to tell. They have shown a steely determination to overcome adversity and safeguard something which is very dear to their heart. “Their achievements have adorned the pages of the Hexham Courant, caught the eye of the regional and national media, and even grabbed the attention of the international community. “They have hosted fact-finding visits by delegations from as far afield as Estonia, Norway and Sweden – all anxious to learn first-hand about their tremendous success story. “They have helped save a pub; they have saved a shop from closure; and they have demonstrated the irresistible force of community spirit. The awards were collected by HCVL directors Brian Earl, Maurice Gilmour and Sally Curry. See the Courant’s report and picture here or check out the video and photo gallery of the event. On Wednesday March 30th three directors and three volunteers traveled to to the House of Lords for the national finals of the Countryside Alliance Awards. 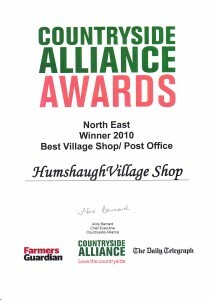 The shop was the North East winner in the Village Shop/Post Office category but was up against 11 other stores from across Britain and didn’t come away with a national trophy. See the post Not Quite Top Shop for the story and pictures. World Book Night comes to Humshaugh Village Shop on Saturday March 5th. And it’s doubled in size now that two villagers chosen as givers have decided to pool their resources and give away a total of 96 books. Sally Curry will be giving away 48 copies of “A Fine Balance” by Rohinton Mistry and Richard Hewitt will be handing out 48 copies of “The Curious Incident of the Dog in the Night-Time” by Mark Haddon. Click on the titles to find out more about the books. The shop will be open from 4pm to 7pm so that villagers can pop in for a chat, a drink, some nibbles and a free book. The plan is that once you’ve read, and hopefully enjoyed your book, you’ll pass it on to someone else who will in turn do the same. With the full support of the Publishers Association, the Booksellers Association, the Independent Publishers Guild, the Reading Agency with libraries, World Book Day, the BBC and RTE, one million books will be given away by an army of passionate readers to members of the public across the UK and Ireland. The twenty-five titles were selected by a wide-ranging editorial committee, chaired by James Naughtie. Amazing stuff! Our rivals for the regional award were David Carr’s Shop at Longframlington, which received a highly commended award, and Allendale Co-op. Click here to see all the regional winners on the Countryside Alliance’s website. Congratulations to everyone who’s been involved – it’s something to be thoroughly proud of. There’s no such thing as bag publicity (sorry). 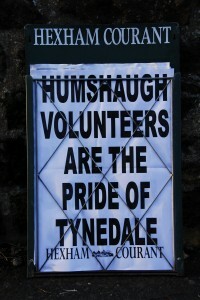 After The Journal ran a big page lead about our Humshaugh shopping bag exploits (Saturday February 5th 2011), The Sue Sweeney Show on BBC Radio Newcastle interviewed Steve Robins on the phone. The newspaper article, minus its photos, is here on the Journal’s website. You can listen to the interview by clicking here: Steve Bag Shots BBC Radio Newcastle 20110205 128 and then on the same link on the next page. Click here to see our brilliant new bag gallery. Your photos of your shopping bag from our shop.